DTE stands for "Data Terminal Equipment" and DCE stands for "Digital Communication Equipment" and both are used in the interfacing of GSM modem. These DTE and DCE commands are used in various ways as some commands are used to set registers and some are used echo and suppression of code. 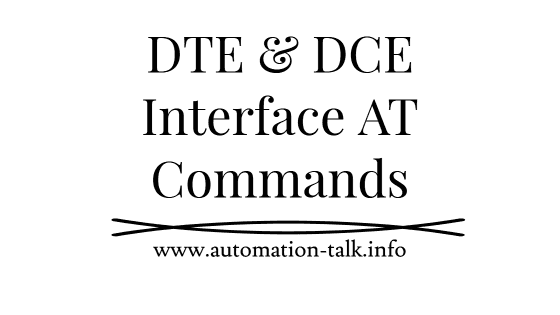 We have collected set of these DTE and DCE commands with description and syntax which will help you in Using them. Subscribe to PLC, HMI Programming and SCADA Tutorials by Email . It is used to set a register which controls the operation of the DCE. 2. AT E: Command echo. It is used to set whether or not the DCE echoes characters received from the DTE during command and online command state. 3. AT Q: Result code suppression. It is used to set whether or not the DCE transmits result codes to the DTE. 4. AT V: DCE response format. It is used to set the contents of the header and trailer transmitted with result codes and information responses. 5. AT X: Result code selection and call progress monitoring control. It is used to Set whether or not the DCE transmits particular result codes to the DTE. 6. AT &C: Circuit 109 (Received line signal detector) behavior. It Sets how the state of the DCD line relates to the detection of received line signal from distant end. Syntax: AT &C[<value >] (Values can be 0 and 1 for always ON and in accordance with underlying DCE-default). 7. AT &D: Circuit 108 (Data terminal ready) behaviour. It Determines how the DCE responds when circuit 108/2 (DTR) is changed from the ON to the OFF condition during online data state. It Specifies the data rate at which the DCE will accept commands. It Controls the operation of local flow control between the DTE and DCE during the data state. Subscribe to Automation-Talk by Email For more AT Commands Tutorials.